Work being carried out by South East water is unlikely to affect traffic on the A28, Chart Road.Details were exhibited today at Godinton Village Hall of work proposed to reinforce the water supply in preparation for the construction of 5000 homes at Chilmington Green. 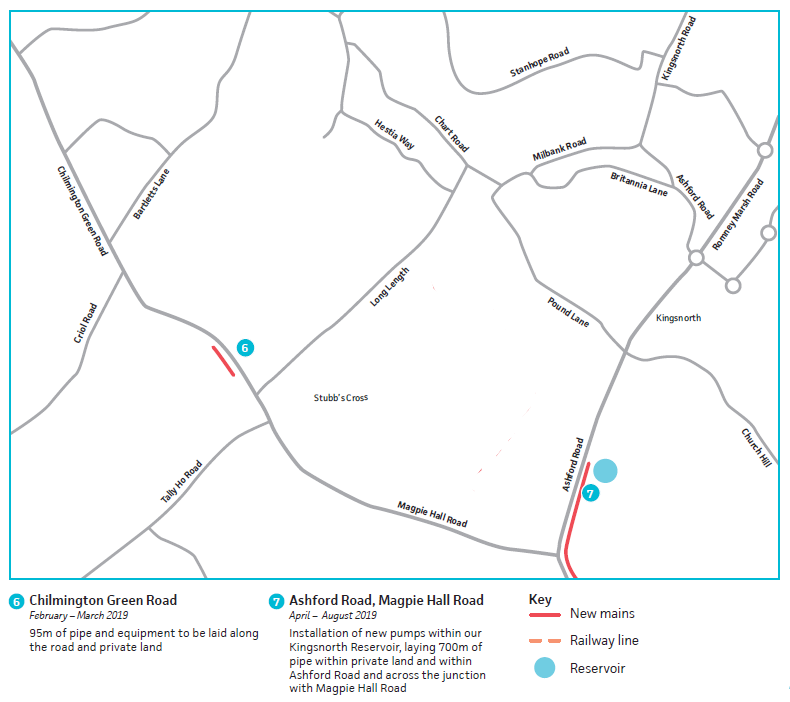 Whilst works may cause disruption on Godinton and Repton Park, the 200m of pipe to be laid along Chart Road will be laid in the verge avoiding any need for disruption to traffic. 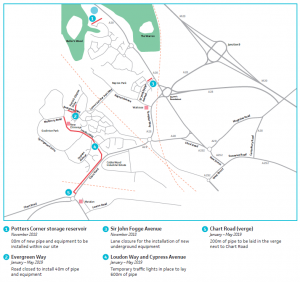 Work will also be carried out on Ashford Road and Magpie Hall Road in Kingsnorth. 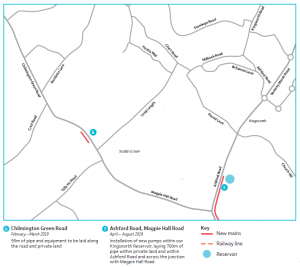 As part of an ongoing programme to improve the water supply network South East Water are planning to install a number of new water mains across Ashford. The £1.3 million project will involve the installation of new equipment and water pipes, which will help us to increase the amount of water they can pump through their extensive network of underground pipes and better control the flow of water. It will also ensure they can continue to maintain water pressure to the area as the Chilmington Green development is built. 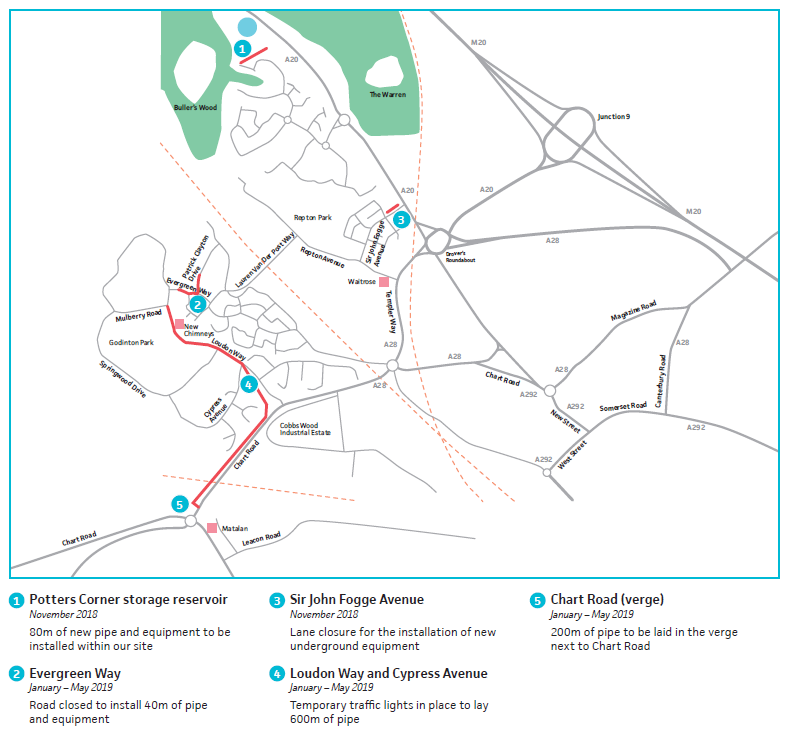 South East Water are still shaping our plans, but work will take place in the following roads; A28 Chart Road, Chilmington Green Road, Evergreen Way, Loudon Way, Sir John Fogge Avenue and Sweet Bay Crescent. Work is due to start in October and last for 10 months. Sout Eat Water’s project team will be holding a drop-in session for local businesses and residents to find out more about the scheme and answer any concerns you may have. This will take place between 5pm and 7pm at Godinton Village Hall, Loudon Way, Ashford, TN23 3JJ on Thursday 27 September. 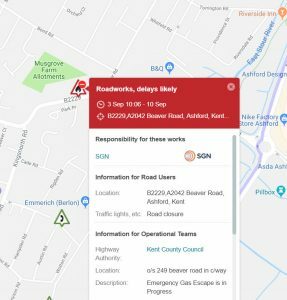 To keep motorists, pedestrians and their staff safe, a mixture of road closures and temporary traffic lights will be used throughout the works, and will be agreed with Kent Highways before work starts. If you have any concerns during working hours then their contractor, Clancy Docwra, will happily answer any questions on site. If you would like to speak to South East Water direct please call our Customer Technical Centre on 0333 000 1100. SGN will be commencing essential works in Christchurch Road. Closure at the junction of Jemmett Road is planned to commence from 12th March 2018 with an estimated completion date of 10th April 2018. Due to the nature of these works, it will not be possible to re-open the road outside hours. Limited access will be maintained whenever it is safe to do so, but there are likely to be delays and certain times when this is not possible for safety reasons. Our operatives onsite will be available to assist you and offer information as to the progress of these works. DBEIS looking for views on adding a safeguard energy tariff imposed by Ofgem (the regulator) for vulnerable consumers on standard variable and fixed-term default tariffs to the list of fuel poverty measures for which public authorities can share data with gas and electricity suppliers for the purpose of assisting households in fuel poverty. Part 5 allows data sharing between specified public authorities and energy suppliers for the purpose of alleviating fuel poverty. The data sharing must be for use under one of the fuel poverty measures listed in section 36(3) of the Act. The list currently includes measures such as the Warm Home Discount and the Energy Company Obligation scheme. Other fuel poverty measures, such as Ofgem’s proposed safeguard tariff for vulnerable consumers at risk of fuel poverty, are not currently covered by list, so this consultation is about adding it to the list. I & G Contractors Ltd working on behalf of SGN have planned gas mains replacement works in Clockhouse, Ashford. 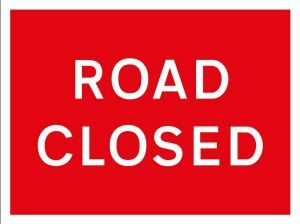 Due to the nature of the works and the location of the gas main, Clockhouse will be temporarily closed from the junction of Brookfield Road. A signed diversion will be in place. In consultation with Kent County Council, I&G Contractors will start work on Monday 26th February 2018 for approximately 2 weeks. I&G Contractors would like to apologise for the disruption their work may cause and thank you in advance for your co-operation while they invest in the gas supply network in your area. 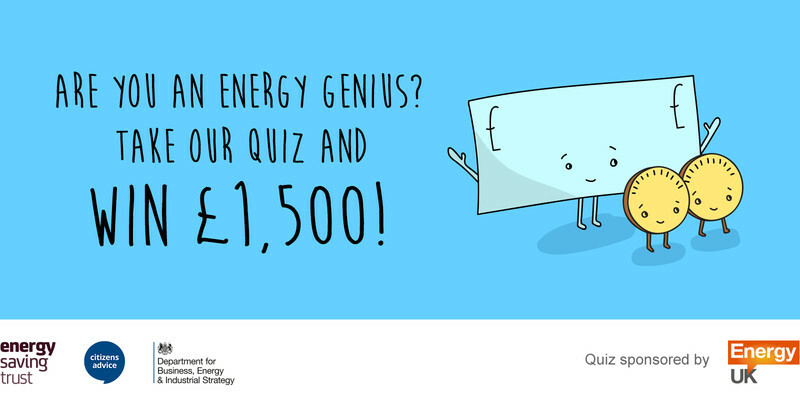 Are you an energy genius? Big Energy Saving Week is here! Running between October 31 and November 6, the campaign is calling on the nation’s bill payers to take control of their bills and grab some extra cash. And to celebrate #BESW2016, the Energy Saving Trust is offering you the chance to win £1,500 by testing your knowledge of the best ways to save on your energy supplier. For example, did you know that the average UK bill-payer can save around £300 just by switching supplier or tariff? And many households may be letting myths hold them back from getting the best deal from their energy supplier. More than 70 per cent won’t switch to a small supplier they haven’t heard of, even if they could save them money, while some wrongly believe that changing supplier means rewiring your property – or that they have a limited supply of energy compared to their competitors. Take the quiz and put yourself in with a chance of winning £1,500, and prove you’re switched on to saving! This doesn’t mean doing without – you can waste less by being energy efficient. The Energy Saving Trust estimates that the average home in the UK could save up to £130 per year – and avoid emitting 500kg of carbon dioxide – simply by taking energy saving steps. Energy bills are a significant concern for households. But you could save hundreds of pounds a year on your fuel bill by simply checking you’re not paying more than you have to for your energy. Follow our three simple steps below and you could reduce your fuel bill without having to cut down on the energy you use. 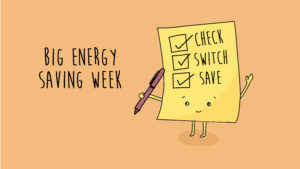 Check, switch, save this Big Energ y Saving Week. Don’t be on energy autopilot. People can use the Citizens Advice price comparison tool to compare prices from different energy suppliers.